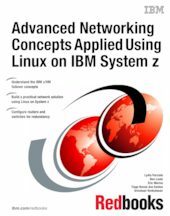 This IBM® Redbooks® publication describes important networking concepts and industry standards that are used to support high availability on IBM System z®. Some of the networking standards described here are VLANs, VLAN trunking, link aggregation, virtual switches, VNICs, and load-balancing. We examine the various aspects of network setups and introduce the main Linux on System z networking commands and configuration files. We describe the management of network interface parameters, assignment of addresses to a network interface, and usage of the ifconfig command to configure network interfaces. We provide an overview of connectivity options available on the System z platform. We also describe high availability concepts and building a high availability solution using IBM Tivoli® System Automation. We also provide the implementation steps necessary to build a redundant network connections set up between an IBM z/VM® system and the external network switches using two Open Systems Adapter-Express 3 (OSA-Express 3) adapters with 10 Gb Ethernet ports. We describe the tests performed in our lab environment. The objectives of these tests were to gather information about performance and failover from the perspective of a real scenario, where the concepts of described in this book were applied. This book is focused on information that is practical and useful for readers with experience in network analysis and engineering networks, System z and Linux systems administrators, especially for readers that administer networks in their day-to-day activities. For additional reading: A Technote is availalble that explains changes to using channel bonding interfaces introduced with SLES 11 SP 2.